A full tang, 440 stainless steel blade where the blade measures four and a half inches and is four millimetres thick. Sharp enough to cut through crackling, make feather sticks and solid enough to baton wood. 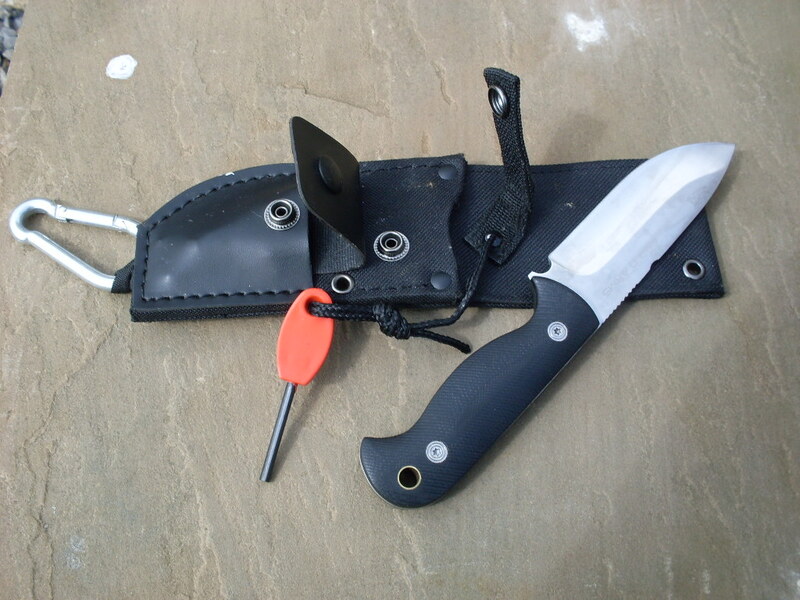 The sheath is thick nylon with a pocket which holds a small whistle and fire steel (included). The fire steel, while small, is a handy back up should you forget your main one or if the flint goes on your lighter. A notch on the back of the blade can be used to strike sparks from a fire steel (far more effectively than the silly bits of metal they come with!). I found this a solid, decent knife with a good grip. I bought mine from bladesandbows.co.uk. It’s important to always keep your knife sharp, as blunt blades cause accidents! Lansky knife sharpeners put a fine edge on a blade. Well worth the investment and keep one in your pack.